I had the unique opportunity to shadow Chuck Burke, senior editor and design editor at the Chicago Tribune, on March 17. From 11:50 a.m. to 7 p.m., I had Mr. Burke (almost) all to myself, chatting, following him to his meetings, and peering over his shoulder as he designed the Business section of the Tribune for the next day. What a crazy experience! Besides getting to talk and get career feedback from a higher-up at an extremely reputable newsroom, I also got to briefly meet the editor in chief of the Tribune, Gerry Kern, sit in on the editorial meeting during which they determined what would go on the front page for the next day, and tour the editorial floor of the Tribune Tower. The editorial floor was quieter than I expected. Men and women sat at their computers, some on social media, some on Adobe Creative Suite programs, and some typing busily to meet their deadlines. I followed Mr. Burke to his workplace, right on the outskirts of the main mass of editors’ desks which was separated by thin aisles of walking space. Exiting the subdued buzz of the newsroom, we sat in a deserted glass-wall office and discussed my career, The Wheaton Record, and typography. Unsurprisingly, typography and design were where Mr. Burke and I found the most to talk about. The man was a design connoisseur. I mean, one of his computer monitors was elevated by a stack of “Best of Newspaper Design” editions. No wonder he found his way to the top of the newsroom food chain! I probably shouldn’t say too much about the whole editorial and design process, but I was heartened by the fact that these design editors, with all those big-time newspaper funds at their disposal, were still using Adobe InDesign as their main workhorse. That’s the software that we’re using at the Record! They even sometimes had to fill white space with “artsy” designs just like us. Their top editors met and argued like we do. That gave me confidence that, even with all of our faults and obstacles, we are headed in the right direction and are doing the most we can with what we have. 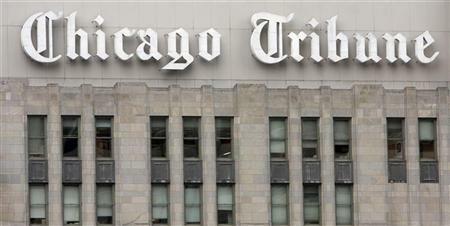 I’m excited to return to the Tribune this Thursday, and promise to blog about my visit to the Tribune editorial board! Next > I landed a (crazy) internship! !